Web Optimization – Part 1: The Home Page - A Digital Marketing Agency | IIAS - International Internet Advertising Services Inc. 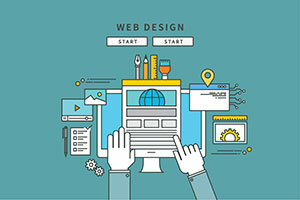 Web optimization is a process used to maximize the number of visitor “conversions.” On an ecommerce website, a conversion is a sale, but conversions include any visitor action promoted on the site, such as filling out a Request for Quote form, sending an email or making a phone call to the company. We have a 38 point evaluation model that examines 9 aspects of a site’s components, and in this new series, we’ll delve into some of the factors we look at to optimize a website. In most cases, a visitor enters the site on the Home Page. For new visitors, this page is their first introduction to your company and making a good first impression is critical. Web users make decisions at lightning speed, so you only have a few seconds to convince them not to click away to someone else. The company name and services are clearly identified. This may sound obvious, but it’s really important to have the name clearly visible. This allows visitors to confirm that they’ve landed on the site they’re looking for. Next, they want to confirm that you sell what they’re looking for; and third, they want to make sure that you provide services or deliver to their location. Make sure these three bits of information are noticeable at a glance. The Home Page provides a clear overview of the content, features and functionality available. Visitors come to your site with a purpose, and the more scenarios you envision, the better able you’ll be to provide the information they need on your Home Page. Let’s say you sell women’s clothing. At a minimum, users want to know if all of your products are shown on the site; and can they buy online. If you’re a service provider, they’ll want to know if they can make an appointment online, or request a quote. If your site has more advanced features, like uploading a photo to “try-on” eye glasses for example, that’s something else that you want to let them know on the Home Page. The Home Page effectively directs users to their desired information and tasks. Up to this point, your goal has been to keep users on the Home Page long enough to take the next step towards a conversion. Now, you need to make sure that taking that next step is easy. Continuing with our women’s clothing example, the user wants to buy a red sweater. At this point, they know you sell women’s clothing, and they know that they can make a purchase online; so how to they find the red sweaters? Again, keep in mind that this user may have no loyalty to your company, so they are not going to put much effort into the search – there are plenty of other sweater sellers out there. A search function at the top of the page, or several category boxes (e.g. Dresses, Shirts, Sweaters) are examples of ways to keep visitors on the path to conversion.